This Horn Drinking Beaker is a recent acquisition to the Museum collection. 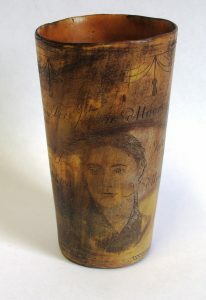 The beaker dates from the time of the Peninsular War and is engraved with the owner’s name – William Hallen, who served with the 95th as Lieutenant. On the reverse of the beaker is a portrait of Sir John Moore who died in January 1809. For more information on this item see Object of the Month. Portrait of Sir John Moore engraved on the reverse.